McNabney Marsh is a part of the Peyton Slough Watershed. The marsh boundaries are Waterbird Park on the East and South, I-680 and the Mountain View Sanitation District plant road on the West, and the Waterfront road and the railroad lines to the North. 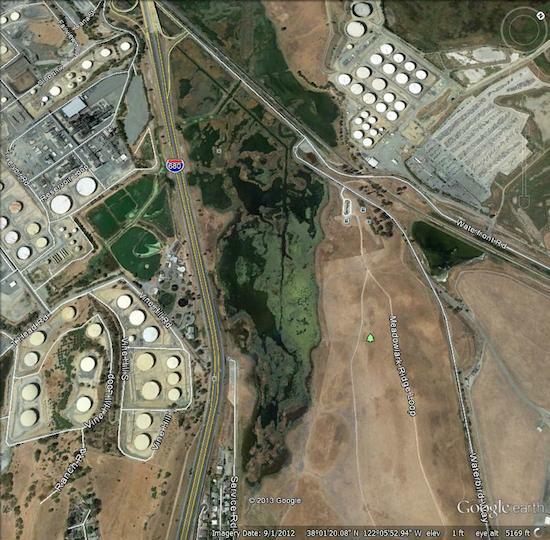 This Goggle Earth image shows the marsh location and demonstrates that the railroad line bisects the marsh from another portion of the Peyton Slough Watershed adjacent an industrial complex. In 2014, a project to widen the the railroad trestle will be implemented. The Saint Mary's College GIS/Remote Sensing course will collect data on the marsh this Fall before the trestle improvement project is implemented.